USDA organic. Fair Trade certified. 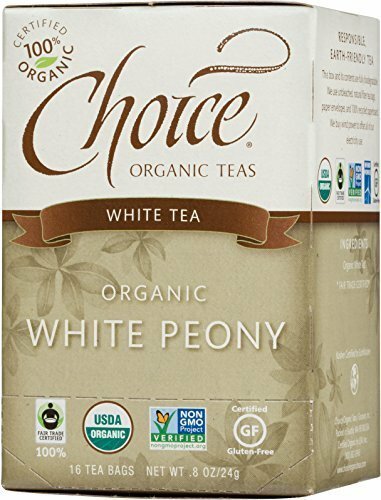 Choice organic White Tea is the result of specially-plucked leave & tender buds. Minimally p0rocessed, no bruising of the leaf occurs, and great care has been taken to produce the unique style, known as White Peony. Ours is a delightfully subtle white tea with fresh, floral notes, lingering sweetness, and sensual body. Choice Organic Teas are certified as organically grown by an independent third party. A thorough audit trail follows the tea from the gardens of origin to your cup, and every aspect of the cultivation, handling and packaging is carefully inspected to insure the integrity of this organic product. Choice Organic Teas come from mountain top gardens tended by traditional methods. Without chemicals, our Choice tea growers practice careful topsoil management and weed control, creating a balanced environment to alleviate any agricultural problems. With expertise and very diligent care, they achieve exceptional teas. Fair Trade guarantees fair wages for workers, improving their opportunities for better healthcare. By choosing Fair Trade tea, you are directly contributing to the livelihood of tea growing communities. This Fair Trade tea is independently certified by TransFair USA. Certified organic by QAI, Inc. If you have any questions about this product by Choice Organic Teas, contact us by completing and submitting the form below. If you are looking for a specif part number, please include it with your message.